The modern age of space exploration exists largely because of the actions of two countries who competed to get the first people on the Moon: the United States and the former Soviet Union. Today, space exploration efforts include more than 70 countries with research institutes and space agencies. However, only a few of them have launch capability, the three largest being NASA in the United States, Roscosmos in the Russian Federation, and the European Space Agency. Most people know of the U.S.'s space history, but the Russian efforts occurred largely in secrecy for many years, even when their launches were public. Only in recent decades has the full story of the country's space exploration been revealed through detailed books and talks by former cosmonauts. The history of Russia's space efforts starts with World War II. At the end of that huge conflict, German rockets and rocket parts were captured by both the U.S. and the Soviet Union. Both countries had dabbled in rocket science before that. Robert Goddard in the U.S. had launched that country's first rockets. In the Soviet Union, engineer Sergei Korolev had experimented with rockets, too. However, the chance to study and improve upon Germany's designs was attractive to both countries and they entered into the Cold War of the 1950s each striving to outdo the other into space. Not only did the U.S. bring over rockets and rocket parts from Germany, but they also transported a number of German rocket scientists to help with the fledgling National Advisory Committee for Aeronautics (NACA) and its programs. The Soviets captured rockets and German scientists, too, and eventually began experimenting with animal launches in the early 1950s, although none reached space. Yet, these were the first steps in the space race and set both countries on a headlong rush off Earth. The Soviets won the first round of that race when they put Sputnik 1 into orbit on October 4, 1957. It was a huge win for Soviet pride and propaganda and a major kick in the pants for the fledgling U.S. space effort. The Soviets followed up with the launch of the first man into space, Yuri Gagarin, in 1961. Then, they sent the first woman in space (Valentina Tereshkova, 1963) and did the first spacewalk, performed by Alexei Leonov in 1965. It looked very much like the Soviets might score the first man to the Moon, too. However, problems piled up and pushed back their lunar missions due to technical problems. Disaster struck the Soviet program and gave them their first big setback. It happened in 1967 when cosmonaut Vladimir Komarov was killed when the parachute that was supposed to settle his Soyuz 1 capsule gently on the ground failed to open. It was the first in-flight death of a man in space in history and a great embarrassment to the program. Problems continued to mount with the Soviet N1 rocket, which also set back planned lunar missions. Eventually, the U.S. beat the Soviet Union to the Moon, and the country turned its attention to sending unmanned probes to the Moon and Venus. In addition to its planetary probes, the Soviets got very interested in orbiting space stations, particularly after the U.S. announced (and then later canceled) its Manned Orbiting Laboratory. When the U.S. announced Skylab, the Soviets eventually built and launched the Salyut station. In 1971, a crew went to Salyut and spent two weeks working aboard the station. Unfortunately, they died during the return flight due to a pressure leak in their Soyuz 11 capsule. Eventually, the Soviets solved their Soyuz issues and the Salyut years led to a joint cooperation project with NASA on the Apollo Soyuz project. Later on, the two countries cooperated on a series of Shuttle-Mir dockings, and the building of the International Space Station (and partnerships with Japan and the European Space Agency). The most successful space station built by the Soviet Union flew from 1986 through 2001. It was called Mir and assembled on orbit (much as the later ISS was). It hosted a number of crew members from the Soviet Union and other countries in a show of space cooperation. The idea was to keep a long-term research outpost in low-Earth orbit, and it survived many years until its funding was cut. 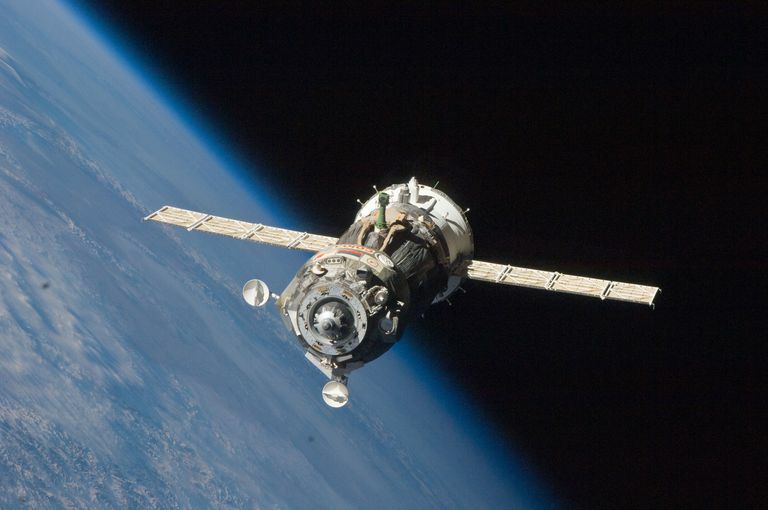 Mir is the only space station that was built by one country's regime and then run by the successor to that regime. It happened when the Soviet Union dissolved in 1991 and formed the Russian Federation. The Soviet space program faced interesting times as Union began to crumble in the late 1980s and early 1990s. Instead of the Soviet space agency, Mir and its Soviet cosmonauts (who became Russian citizens when the country changed) came under the aegis of Roscosmos, the newly formed Russian space agency. Many of the design bureaus that had dominated space and aerospace design were either shut down or reconstituted as private corporations. The Russian economy went through major crises, which affected the space program. Eventually, things stabilized and the country moved ahead with plans to participate in the International Space Station, plus resume launches of weather and communications satellites. Today, Roscosmos has weathered changes in the Russian space industrial sector and is moving ahead with new rocket designs and spacecraft. It remains part of the ISS consortium and has announced Instead of the Soviet space agency, Mir and its Soviet cosmonauts (who became Russian citizens when the country changed) came under the aegis of Roscosmos, the newly formed Russian Space Agency. It has announced interest in future lunar missions and is working on new rocket designs and satellite updates. Eventually, the Russians would like to go to Mars, as well, and continue solar system exploration.